Today is our first official day of summer vacation! Wohoo!!! Last week, for my Tuesday Ten, I wrote about things I am looking forward to this summer. 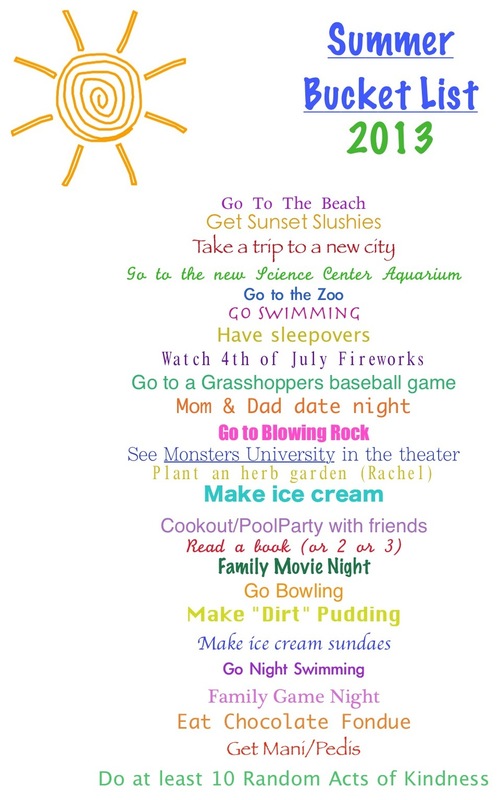 In it, I mentioned that I wanted to make a summer bucket list of things to do with my girls. Well, I did make one! And, that's a good thing since last Friday was their last day of school. The girls gave some input and I added some things, too. Here's what we cam up with - 25 things we want to do this summer! How about you? What's on your bucket list this summer? We are hoping to do a lot of swimming this summer. And my daughter is doing a research project that she is really excited about that will take up a lot of her time. I am so envious! Summer in our region has officially ended but my husband and I have one big surprise for the kids before school starts. At least one last thing to look forward to before we go back to our routine. Whoa! You certainly have a lot planned. Enjoy the break, Lisa! Yes, Tracie - I've had that experience, too! I hope this will help on the days when we are bored. Then, we can look at the list and figure out what we still need to do! It is always hard to get back to that routine! Hope your surprise turn out to be lots of fun! Yay!! Glad you are going to do it! Have fun! We do have a lot planned! Some of it is already on the books, though (trip to the beach, trip to another city). I hope we can do it all!!! Oooohhh - a drive in sounds fun!! Not sure if we have one around here anywhere, but I'll have to check! I can only imagine how our activities will change with time! Good luck! I really need to get on my summer bucket list - I may steal some from you as they sound great! :) I love making lists but for some reason I never get to my bucket lists!